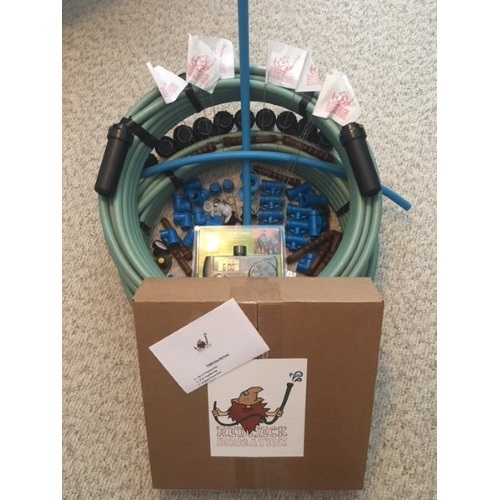 This is THE irrigation kit you've been hoping for-- the Triple Zone Redneck Irrigation Kit! Don't waste $$$$ with a professional! And don't wander around the hardware store hoping to find the "right" parts only to have to return some and buy more! We have put together every possible component you need to install an irrigation system that will fool even professionals! No need for a bunch of tools-- just a shovel and the Redneck Irrigation Kit! Even the connectors are press-to-connect.! This system waters up to 18.750 square feet of lawn (need less? See our other single and double systems!). In as little as 6-8 hours, you can have a complete and easy-to-use irrigation system. Comes with complete instructions and link to video instructions. Why buy the Triple Zone Redneck Irrigation Kit? You don't have to be a redneck-- just someone who enjoys the EASY and INEXPENSIVE life!